The Busch School of Business is one of the newer additions to the Catholic University of America, promising master’s degrees to the best applicants. Currently, three Christendom alumni are studying at the Busch School, working to earn MSBA degrees to complement their BAs from Christendom. 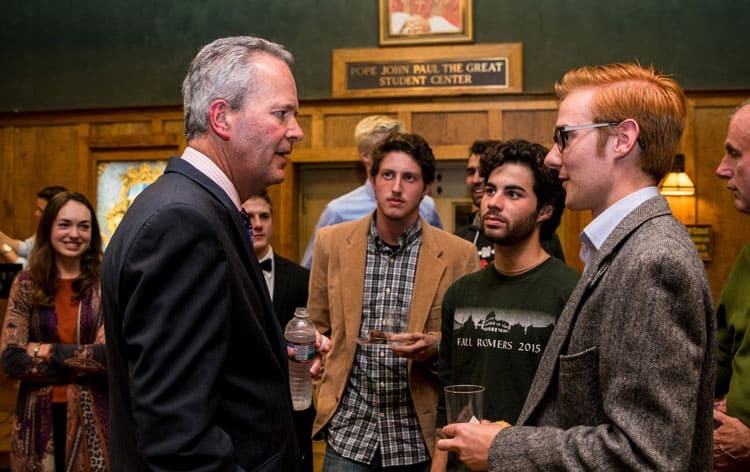 While they wanted business degrees from CUA, the feeling was mutual from the school — they both love and want Christendom alumni, encouraging them to apply each year. 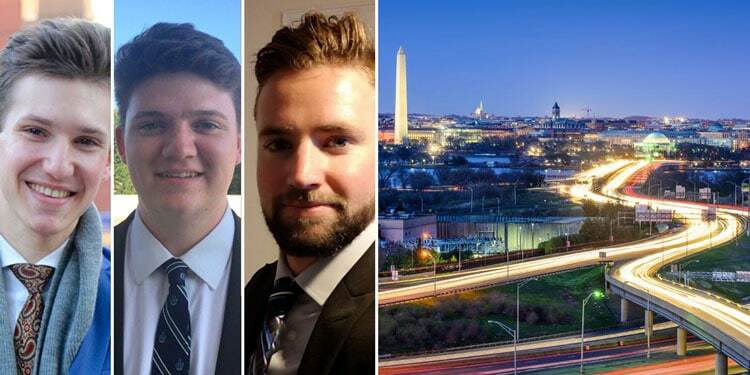 Jacob DeVos ’18, Winfield Turner ’18, and Patrick O’Reilly ’13 are currently studying at the Busch School of Business and are looking forward to graduating after just one year of studying this spring. While O’Reilly and DeVos both earned political science degrees from Christendom, Turner earned an English language and literature degree. Turner is currently in the field of cyber-risk management and sees the combination of his English degree and his business studies as perfect for his career goals. From left to right: alumni Winfield Turner, Jacob DeVos, and Patrick O’Reilly. Turner first heard about the Busch School the same way that DeVos did: from Stewart McHie, the MSBA program director at the Busch School, and from Bill Conlon, the assistant director of the MSBA program. McHie and Conlon come out to Christendom a couple times a year, taking interested students out to dinner to talk to them about the MSBA program. McHie and Conlon bring their own years of experience to the program, giving Christendom students a wealth of opportunities to network and learn. McHie previously worked for ExxonMobil, while Conlon worked inside Parliament while studying in England. When asked about his experience with Christendom students, Conlon says that they are an ideal fit for the Busch School, and sees them as some of his best recruits each year. 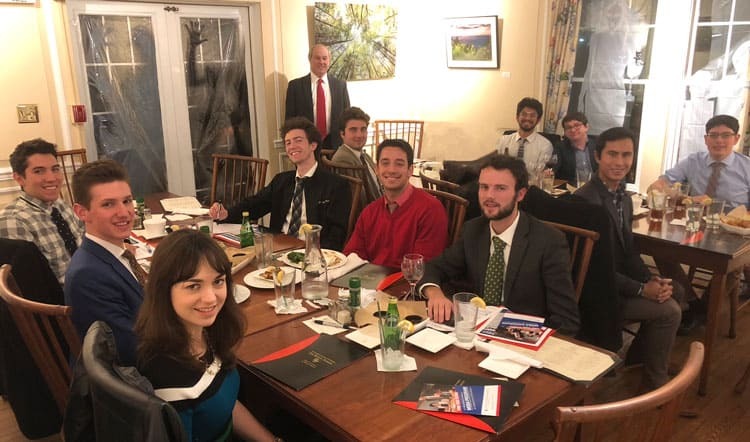 Stewart McHie (pictured at top), the MSBA program director at the Busch School, comes out to Christendom a couple times a year, taking interested students out to dinner to talk to them about the MSBA program, along with Bill Conlon. At the Busch School, the three alumni are studying accounting and financial analysis, integrated marketing, sales management, operations management, and more. They only started this past fall, but they are each already growing in their skills and knowledge of the business world. Their coursework is proving a perfect complement to everything they already learned at Christendom, with their liberal arts background providing a foundation for the rest of their education. DeVos’ desire to enter the business world began while studying at Christendom. When Conlon brought up the MSBA program at the Busch School to him during one of his campus visits, DeVos saw it as a perfect opportunity to continue his education and prepare for his future career. Tim Busch, the namesake of the Busch School of Business, has come to campus to speak with Christendom students in the past. While DeVos and Turner both just graduated last spring, O’Reilly earned his BA in 2013. He returned to his home in California after graduation, working in property management for two years before moving into insurance. When he found out about the Busch School, he saw it as an opportunity to get another edge in the business world while also continuing his education. Many Christendom alumni have gone onto successful business careers after graduation, earning MBA degrees and going on to even become CEOs. DeVos, Turner, and O’Reilly are the latest to follow that path, bringing their Christendom education into the business world and impacting all they encounter, one client at a time.